Info Paul Rusesabagina (born June 15, 1954, pronounced "rə-ses-ə-bä-gĒn-ə") is a Rwandan who has been internationally honoured for his actions during the Rwandan Genocide. He was the assistant manager of the Hôtel des Mille Collines, and was previously the manager of the Hôtel des Diplomates, both in Kigali, Rwanda. 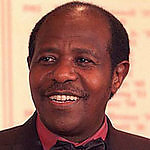 During the 1994 Rwandan genocide, Rusesabagina used his influence and connections as temporary manager of the Mille Collines to shelter over 1,260 Tutsis and moderate Hutus from being slaughtered by the Interahamwe militia. He became better known when this was made into the Academy Award-nominated film Hotel Rwanda (2004). He is an ethnic Hutu, and lives in Belgium with his wife Tatiana, children, and adopted niece and nephew. He drove a taxi in Brussels, and three years later after he arrived in the Belgian capital, he opened a trucking company. Rusesabagina was born in Murama-Gitarama in the Central-South region of Rwanda to a farming family. He wanted to be a pastor when he grew up (he is a lapsed Seventh-day Adventist). He had three children with his first wife, Esther. After they separated in 1981, he graduated from the Hotel Management program of Utalii College in Nairobi, Kenya, which included a trip to Switzerland. When he returned from Switzerland, he was employed in the Mille Collines Hotel as assistant general manager from October 1984 until November 1992, upon which he was promoted to general manager of the company's Diplomate Hotel in Kigali. He met his current wife Tatiana in 1987 at a wedding party. Tatiana was a Catholic Tutsi and was suffering discrimination at her job as a nurse, so Paul arranged for her to be moved closer to him for this reason and to get to know her better. After they married, they had a daughter who died after she was a few days old, and then a son, Tresor. Paul and his family live in Kraainem, Belgium, as of 2006. The Rwandan Genocide started on April 6, 1994 as the Hutu-led Interahamwe began to slaughter the Tutsi population. Though Rusesabagina was of mixed heritage—his father was Hutu and his mother Tutsi—he was relatively safe from the Interahamwe due to his prior work as a diplomat and business connections with important Hutu military leaders. These notwithstanding, his wife Tatiana was a Tutsi, and their children were considered mixed, so he could not escape the war zone with his family without outside help. However, no foreign aid came from the United Nations or its more powerful Western member states until over 900,000 Rwandans had been murdered. When the violence broke out, Rusesabagina brought his family to the Mille Collines for safety. As other managers departed, Rusesabagina phoned Sabena and secured a letter appointing him the acting general manager of the Mille Collines. Despite some difficulty in getting the staff to accept his authority, he was able to use his position to shelter orphans and other refugees who came to the hotel. His neighbours had moved into his house for safety reasons, though Rusesabagina didn't even own a gun. For protection against bombs and grenades they put mattresses against the windows. He described the hardships they faced, which included having to drink the water from the hotel's swimming pool. Murderous Hutu militia threatened to enter the Mille Collines, so Rusesabagina made sure his wife and children could flee in a truck past the militia road blocks. The truck would drive to Kigali airport so they could flee to another country. He himself remained in the hotel because the refugees needed him. Rusesabagina and his wife discussed this decision for hours, because he had promised her he would never leave her in this situation. Rusesabagina wanted to stay however, fearing the remaining refugees would be killed and feeling that he would never be able to forgive himself. The truck was forced to return to the hotel, never having reached the airport. Everybody in the truck, including Tatiana and the children, had been beaten. Tatiana was a specific target for the beatings because she was the wife of the manager of the Mille Collines; the Hutu militia knew she and her children were in the truck owing to radio messages sent out by presenter Georges Ruggiu. Ruggiu was a Belgian who together with other presenters on the station urged the Hutu population to kill all the Tutsis. Ruggiu called Rusesabagina's family "cockroaches who were fleeing, but would return later to kill all the Hutus". We all knew we would die, no question. The only question was: how? Would they chop us in pieces? With their machetes they would cut your left hand off. Then they would disappear and reappear a few hours later to cut off your right hand. A little later they would return for your left leg, etc.—they went on till you died. They wanted to make you suffer as long as possible. There was one alternative: you could pay soldiers so they would just shoot you. That's what her [Tatiana's] father did. Rusesabagina, his wife, children and the refugees eventually managed to escape to Tanzania, thanks to the RPF. After staying in Rwanda for two more years, Rusesabagina applied for asylum in Belgium and moved to Brussels in 1996 after receiving credible threats on his life. Paul Rusesabagina received the U.S. Presidential Medal of Freedom on November 9, 2005 from President George W. Bush.